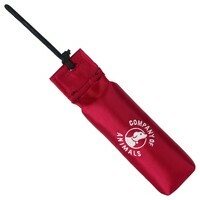 Company of Animals Training Dummy is the ideal product for retrieval training. Being a tremendously bright dummy makes it effortless to find and the attached rope provides the option of throwing long distances. This dummy is made of an outer nylon material and contains a dense cork filling to allow it to float when used in water. The Training Dummy is sure to create hours of amusement and make training fun.